The Eco Vape Vanilla Milkshake V2 High VG E-Juice is a bottle of e-juice designed to provide a smooth classic vanilla milkshake for a sweet and creamy vaping sensation. Eco Vape e-liquids have been developed and made in the UK with no ethanol, alcohol or diacetyl for a pure and consistent vape. Every Eco-Vape E-Juice is made with organic EP and USP-grade nicotine. Nature-identical flavouring with no additives ensure that you get the best and most genuine vape possible. Some of our stock of the Eco Vape Vanilla Milkshake E-Liquid is nearing its expiry date and, as a result of this, we are offering the affected stock from a discounted price of £4.19. Act quickly as this offer is only available while stocks last! 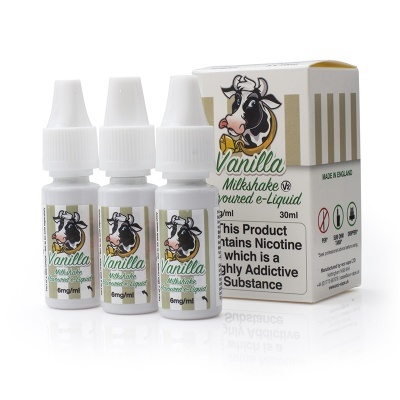 The Vanilla Milkshake flavour has been developed to provide the taste sensations of a classic vanilla milkshake for a velvety and rich vaping experience. This e-liquid is made from 79% Vegetable Glycerin and 21% Propylene Glycol. The Eco Vape Vanilla Milkshake V2 High VG E-Juice is available in 30ml (3 x 10ml bottles). Djinni Banoffee E-Liquid - Money Off!